You’ve already mastered uploading your menu in the SinglePlatform portal, linking your menu to Facebook, and claiming your business on important search engines and review sites. What’s next? Well, maybe you’ve decided that after learning a little more about menu engineering you want to switch up the order of your menu items. You’re in luck! 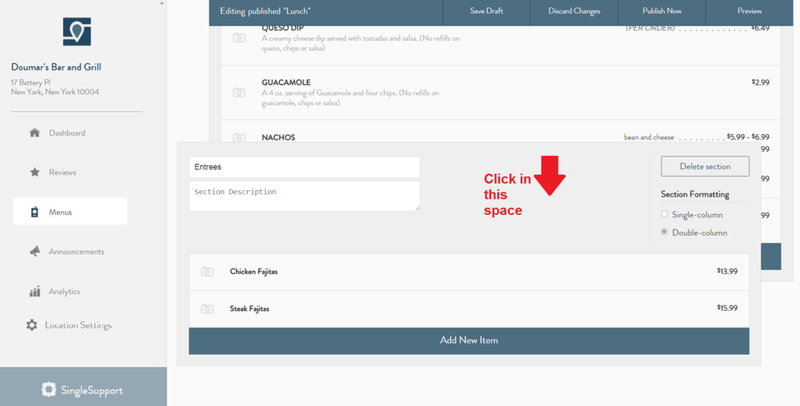 Within the SinglePlatform portal, making changes to your menu is easy as dragging and dropping. We’ll walk you through the step-by-step process of reordering your menu, menu items, and sections so you can always keep your content up to date. Click Edit on the menu whose position you want to change. Click inside the box to the left of the name and change the number to be the new position you want it to be. Note: The menu in the top position is number “0”. 3. Click on the Menus section button in the left navigation bar to verify the menu order is correct. 4. Note: This is how it will look on your SinglePage. Once you’re in a specific menu, place your cursor over the item you want to move, and click down on the handle to the left that appears. Drag your item to its new position. Reordering menu items is as easy as that! Let’s take a look at reordering sections next. Place your cursor inside the section you want to move, but not inside of a field. Click down and drag the section to its new position. You will not see a handle or the cursor change shape. Release your mouse. Now the item will be in its new position. Congratulations – you are now a menu reordering master! Need help or want us to do the work for you? No problem – contact us via email or at 929-254-0250.